The one on the right is the native Arctiidae - Giant Leopard Moth, or Ecpantheria scribonia. The one on the left is the introduced (from Europe in 1879) Cossidae - Leopard Moth or Zeuzera pyrina. Normally you don't find them in such close proximity. I just put them there to illustrate the differences. 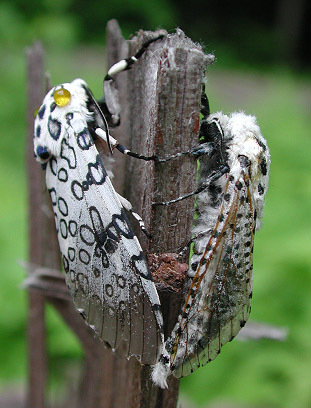 For one, the Giant Leopard Moth on the left has hollow circles. And its abdomen is a good bit shorter than the wings. 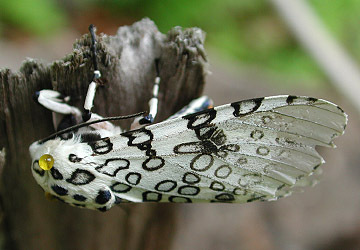 The Leopard Moth on the right is covered with solid black dots. 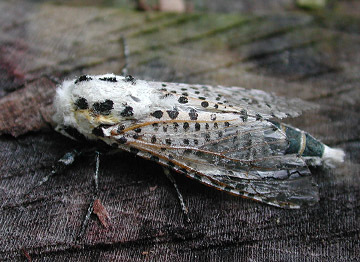 Its abdomen extends past the wings. You can see it curving to the left where it is touching the Giant Leopard's wings. 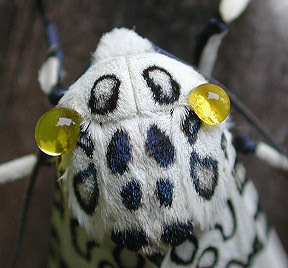 I'm sure you've noticed those yellow droplets on the Giant Tiger Moth. It's not injured. It is employing a chemical defense. Like many arctiidae, moths this group can be unpalatable to birds. Those droplets are produced by glands in the thorax and give the would-be predator a bad taste in its mouth right from the start. Some insects would have to be eaten before the bird finds out it may have been a mistake. -Any satisfaction the individual insect may have derived from teaching the bird that lesson would be hard-realized from within the predator's stomach. Perhaps the droplets produced by this moth serve both as a warning and an early defense system.